Discover and learn more about ADS-B here. Automatic Dependant Surveillance Broadcast or ADS-B is the latest technological leap in airspace surveillance. 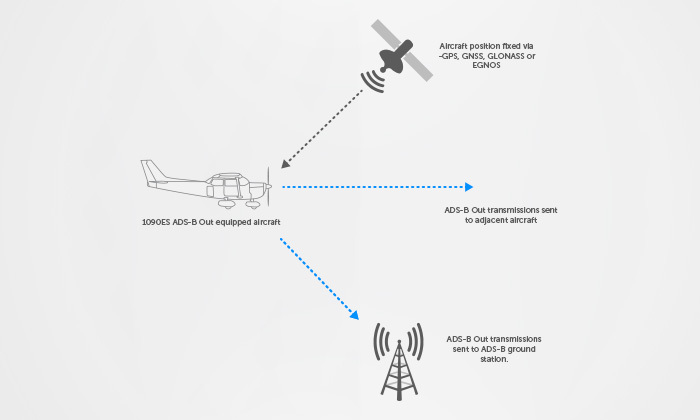 ADS-B uses a Trig transponder, typically combined with a GPS, to transmit highly accurate positional information to ground controllers and also directly to other aircraft. This transmission is known as ADS-B Out and its accuracy is greater than using conventional radar surveillance. This gives air traffic controllers the potential to reduce the required separation distance between aircraft that are ADS-B equipped. ADS-B is seen as being vital to maintaining future efficient airspace management in busy airspace. It also provides advantages in remote ‘non radar’ areas too – here suitably equipped aircraft, with a traffic receiver connected to a display can see other aircraft without conventional radar coverage. This enhances aircraft visibility and reduces the risk of air to air collision. More aircraft can operate safely in the same airspace, so congestion is reduced. ADS-B technology enables more direct aircraft routing – this can generate significant time and fuel savings. With appropriate equipment it’s possible to have a live ‘traffic picture’ in the cockpit. ADS-B enhances flight safety and collision avoidance. Aircraft with ADS-B Out provide air traffic controllers with ‘pin point’ positional and flight information data. Trig supports 1090ES, the ICAO international standard for ADS-B that can be used throughout the world. In time ADS-B will supersede existing surface based radar technology. Today air traffic controllers have to place significant separation between aircraft to ensure safe flight operations. Existing surface radar technology often has limitations: the slow speed of the radar’s return beam, the impact of local geography can hide or mask returns and finally limitations in a radars range and power. The cost of installing and maintaining radar coverage is expensive. These costs are a challenge for many governments. ADS-B is an attractive alternative technology for national air traffic requirements. An ADS-B infrastructure consists of a network of ADS-B ground stations. These typically consist of an ADS-B tower and mast (similar to a mobile phone mast). This provides a cost effective national airspace solution; providing accurate data, with fewer gaps or blind spots. When an aircraft equipped with ADS-B Out flies in range of an ADS-B ground station, the station will receive the aircraft’s ADS-B Out transmission. At the same time the aircraft’s ADS-B Out transmission can also be received directly by other aircraft, that are in range and equipped with an ADS-B In Traffic Receiver. An ADS-B In Traffic Receiver translates local airspace information and using a suitable cockpit traffic display provides a real time ‘traffic picture’ which significantly enhances a pilot’s situational awareness. In remote areas where ADS-B ground stations may not exist an aircraft equipped with ADS-B Out and ADS-B In can see other aircraft that are ADS-B Out equipped. This allows aircraft to operate independently of air traffic services, maintaining separation without any reliance upon a ground based infra-structure. ADS-B surveillance technology that does not rely upon ground controllers was first trialled in Alaska. This region was selected as an early proving ground for ADS-B and associated FAA ‘Next Gen’ technologies. This was due to the significant commercial aviation accident rate suffered in this harsh operating environment. Aircraft were fitted with ADS-B, GPS moving maps and improved communications to enhance safety. In South West Alaska ADS-B (combined with these other initiatives) helped to reduce fatal accidents by 47%. The ICAO International standard for ADS-B is known as 1090 MHz or more usually 1090ES (Extended Squitter). This is the frequency used to transmit ADS-B information. Currently mandates for ADS-B airspace demand the installation of ADS-B Out equipment, but the use of ADS-B In equipment is at the moment optional. (ICAO International Civil Aviation Organisation). ADS-B has been established in commercial aviation operating above 18,000 feet for many years. Now, in common with airliners, GA aircraft fitted with an ADS-B capable Mode S transponder will use something known as ‘Extended Squitter’ to transmit ADS-B Out data. The Extended Squitter is in effect an extended portion of a transponders transmission bandwidth. This contains a data packet of ADS-B information. This data packet holds unique identifying information about an aircraft, its flight position, speed and profile. The ground station interprets this Extended Squitter transmission and can verify the aircraft against its database. Of course it is necessary to always check the specific regulations on transponder use in your country. As a general principle, if you fly in airspace that currently requires a Mode A/C transponder there’s a good chance that you will need to operate with a ADS-B 1090ES Out solution (if and when a mandate is required). Uniquely, and only in the U.S. another ADS-B system can also be used called UAT. This system has limitations, it can only be used by pilots operating below 18,000 feet and only within U.S. airspace. A UAT transmitter uses 978 MHz, in contrast 1090 MHz – the ‘international standard’. All Trig transponders are 1090 MHz compliant. As the U.S. ADS-B network is a dual system which supports both 1090 MHz and 978 MHz, it is possible to install a variety of configurations of ADS-B equipment. This dual system does mean that ADS-B ground stations have to re-broadcast ADS-B traffic information on both 1090MHz and 978MHz (UAT). This allows aircraft equipped with ADS-B In Traffic Receivers to ‘see’ all aircraft irrespective of their own ADS-B Out/In equipment. Ground stations broadcast ADS-B information known as; TIS-B (Traffic Information Service Broadcast) and FIS-B (Flight Information Service Broadcast – this includes weather information, FIS-B is only broadcast on 978MHz (UAT). To receive a Traffic Information Service Broadcast (either on 1090 MHz or 978 MHz) the FAA requires that you must first have a certified ADS-B Out transmission. Fitting a Trig transponder provides the easiest upgrade path to secure a certified ADS-B Out signal. Countries such as the America, Australia and Fiji are creating an ADS-B infrastructure. In the U.S. oil and gas platforms in the Gulf of Mexico rely upon high levels of helicopter traffic, here ADS-B is being used to improve visibility, traffic information is now used where no radar service exists. Congestion of airspace around the Eastern seaboard of America is another area where ADS-B is expected to bring genuine benefits, as it is implemented. In the Australian Outback ADS-B will, for the first time, enable aircraft to retain a surveillance capability via direct 1090ES air to air communication. The FAA estimates that without changes to the U.S. air traffic infrastructure, (of which ADS-B technology is one part) the cost to the U.S. economy will be $22 billion in lost economic activity by 2022. The U.S. initiative to overhaul the air surveillance infrastructure which includes ADS-B is known as ‘Next Gen’. This initiative is predicted to make a positive environmental impact by 2018, with estimates of reduced fuel consumption of 1.4 billion gallons, reduced emissions of 14 million tons and estimated savings of $23 billion in costs. Whilst these estimates are based upon commercial flight operations it is undeniable that ADS-B will positively impact GA too. Already ADS-B Out equipped pilots may receive more direct routing with shorter flight times making time and fuel savings a reality for all.